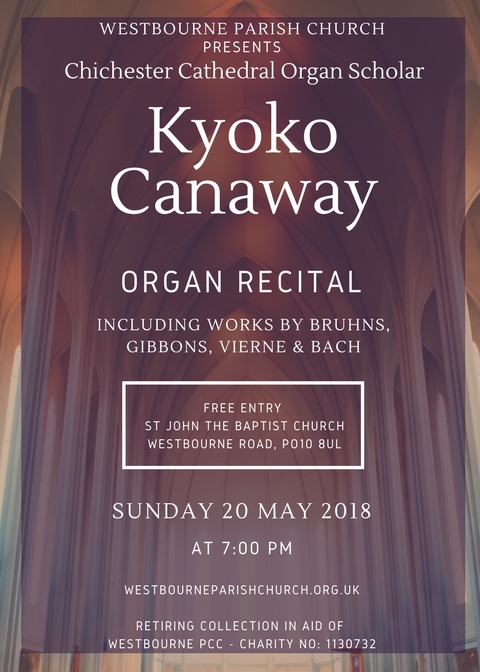 A fund-raising organ recital at Westbourne Parish Church given by Kyoko Canaway, Organ Scholar at Chichester Cathedral, attracted an audience of more than one hundred people. Kyoko performed a well-received programme of English, German and French music on the church’s organ, designed and installed by the renowned organ builder Kenneth Tickell, on Sunday 20 May 2018. Building on the success of this event, the church plans to hold another recital in September and then to set up a regular annual series featuring a rising star in the summer and an established artist in the autumn. Proceeds will go to the church’s organ maintenance fund. The next artist in the organ series will be Charles Harrison, Organist at Chichester Cathedral on 16 September 2018 at 7pm. Reserve the date in your diary! Book your ticket online. There is a long and distinguished tradition of music making at St John The Baptist Church, Westbourne, both in its worship life and as a concert venue. For the latest contribution to that tradition, the church is proud to present an organ recital by the current Organ Scholar at Chichester Cathedral Kyoko Canaway. Announcing the recital, the church’s Director of Music Stewart Taylor said: “We are fortunate at St John The Baptist to have a quite exceptional organ – certainly one of the best in West Sussex and a fine example of just how good a modern pipe organ can be. Its responsiveness and broad range of tone colours encourage artistic playing and make it suitable for organ music of all periods. Kyoko Canaway, who is also Organ Scholar Designate at Gonville and Caius, Cambridge, will be performing a wide-ranging programme, including early organ music by Gibbons and Bruhns, moving to the Baroque master himself, JS Bach. She will also demonstrate the versatility of the organ by playing music of a more Romantic style by two of the great French organist-composers, Vierne and Saint-Saens. The Recital takes place on Sunday 20 May 2018 at 7pm. Entrance is free, with a retiring collection in aid of church funds.